Video in excellent condition, guaranteed to play like new. Digital copies and codes not included. The beloved character written by Edgar Rice Burroughs comes to life in the Disney cartoon adaptation of "Tarzan." The "Tarzan" story follows the life of a man lost in the jungle as a child and raised by apes. Overall, this Disney cartoon version of the story carefully follows the original concept. 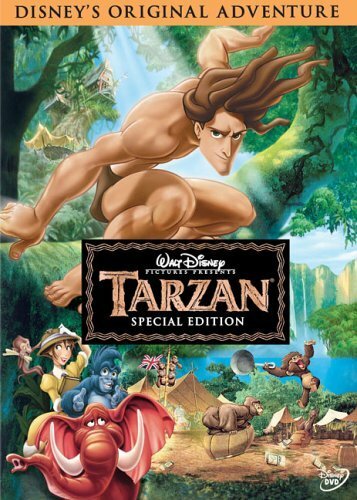 Included in the DVD is the Disney movie "Tarzan" along with a number of special features. This DVD includes three different built-in games, a documentary on life in the jungle, a selection of deleted scenes, music videos, and an alternate beginning to the movie. "Tarzan" is an especially mastered version released by Disney using a visually stunning technology called deep canvas 3-D to give the film an almost 3-D feel although it is portrayed in 2-D. "Tarzan" is rated G. That means the movie is suitable for children ages three and up. That does not mean that adults will not enjoy the DVD as well.